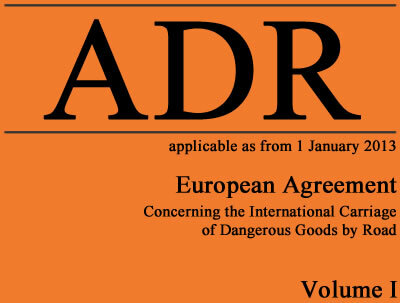 ADR Regulations govern the transportation of hazardous goods across most of Europe. They are based upon the recommendations of the Committee of Experts of the United Nations. For transportation solely within the UK we use regulations known as the Carriage of Dangerous Goods and use of Transportable Pressure Equipment Regulations (CDG) for this purpose; however you must still hold the necessary ADR certificate to transport hazardous goods under either set of regulations. Until 2004 the regulations were mainly the concern of the carrier and the driver. However, from 2004 two main changes were made to the regulations. Firstly, our own CDG regulations had to be harmonised with ADR regulations, so our regulations are now very close to those of ADR. The second change was that many more people were given responsibilities under the regulations; these now affected loaders, handlers, fillers and consigners. In 2009 these regulations were again changed to include consignees. We now have the situation where almost any person involved in the supply chain where dangerous goods are involved come under the regulations. McPherson Training have been involved in ADR Training for some ten years and as well as delivering the approved ADR course, which is required prior to a candidate taking the exams for their certificate of competence. An initial ADR course lasts five days with the examinations being externally marked by the SQA. The qualification has to be retaken every five years. Initial courses can now be counted as part of the Drivers CPC periodic training programme where the training provider is accredited to provide both ADR and CPC training, we are pleased to announce that McPherson Training are in the happy position of holding both accreditations.